Many Monday evenings a month I, and other mentors / MPs and advisers, teach aspiring female politicians the art of interview, presentation and the "rules" of the political game. This initiative inside the Conservative party is called Women to Win, and is one of the things I am most proud of doing these last few years. The women are all brilliant, passionately committed to their country and would be ideal MPs. They come from all backgrounds, ethnic origins, and all parts of the UK. Their list of accomplishments before getting involved in political life always staggers me - albeit it is hard to get them to sell their past achievements. There is a particular skill to creating a cv, conducting a 15 question political interview, and fundamental need to practice. No one knows everything there is to know about the options on Syria, the care reforms, the new rules on welfare and the complexities of local education provision and the academy reforms. Such things genuinely need discussion, study and practice if you want to get involved. This is what we do most monday nights, from 6.30-9. That is not bigging up present MPs - but we do spend a lot of time actually getting our heads round the policies we debate, decide and shape. You will not effect change without understanding the levers of government, the funding, and specifics of government action / policies and the usual government law of unintended consequences. Then you need to understand how this impacts on your local community, which is where being a local MP, councillor or candidate kicks in. I find the process fascinating. For my part I am absolutely committed to getting more women involved in politics, whether it is local or national. Almost without exception they are brilliant. The 2010 crop of female MPs are stuffed full of outstanding women - some of whom I hope will be promoted in the summer reshuffle. Liz Truss, and Liverpool's Esther McVey have led the way and I would expect other female MPs in the 2010 intake to be promoted. If this encourages the future stars, who I am helping to train, then so much the better. It is clear that there is no glass ceiling anymore. But the recent demise of Julia Gillard, the first Australian PM has upset me. I am absolutely convinced that the way she was treated would discourage others from getting involved. Politics is a roughish game and you are often criticised unfairly, in circumstances when I have not met any politician who did not get involved for any other reason than because they fundamentally wanted to serve their community. That applies across the political board. I have labour and liberal colleagues I admire hugely, albeit I disagree with their political views. But the questioning of her sexuality, figure and campaigns entitled "ditch the witch" bring shame on Australia. President Obama wrote in his first book that he always knew there would be plenty of elbows in the ribs as he journeyed up the political ladder, and it is true you have to acquire a thickish skin to rise above the criticisms and slanted approach. But I remain utterly convinced that British politics will be massively improved with greater female representation and will do all I can to help these amazing women on the way. That is why tomorrow night between 6.30-9 I shall be skipping dinner to help these wonderful women on their way. - hospice care from tynedale hospice at home, with whom I met on Saturday. I know the team well and have fundraised for them in the past, but it was really good to meet George, the new chairman. - on Friday I also met a number of the domicilliary care providers. They do a vital job visiting the elderly 3-4 times a day. However, it is clear that the model of care provision is particularly complicated and expensive to provide in rural areas. We are working on this and looking to meet with the county council soon. - finally I have spent a lot of time with specific care homes of late, from discussions with Wellburn, to visiting multiple other homes lately like Helen McArdle's home in Hexham at Acomb Court. The problems faced by all care providers and the state remain the same. How do you provide quality care for our loved ones, in a safe and reasonably regulated setting, without making the care provision uneconomic for either the state, whether it be county council or the commissioning group, or the local business doing the providing, to run? All this in the context of the government plan to introduce a cap on adult social care costs in 2016 which will limit the amount an individual has to contribute towards the cost of their social care. The present system unfairly penalises those who were thrifty in their adult lives and saved, such that they are forced to sell their homes to pay for care. This new reform will give certainty in old and middle age. Tomorrow is a very big day: Mark Carney takes over the Bank of England. In past times bankers were not important. Scrub that thought. The man who takes over the governorship of the Bank of England on Monday is very important to every one of us. And in the Canadian, Mark Carney, we have the man for the job. He has the key job of nurturing the economy, stimulating bank lending, stopping inflation and generally shepherding our financial state back to the good times. He has a 5 year contract. We are all going to need him to be as good as people say he is. Take nursery education: the spending round confirmed that the government will continue to fund free childcare places for 3 and 4 year olds and that it will extend this to the most disadvantaged 2 year olds later this year. What a contrast to Labour’s legacy of unaffordable childcare, where working mothers would only break-even on childcare costs after working for 4 months. The pupil premium: which is being protected in real terms. 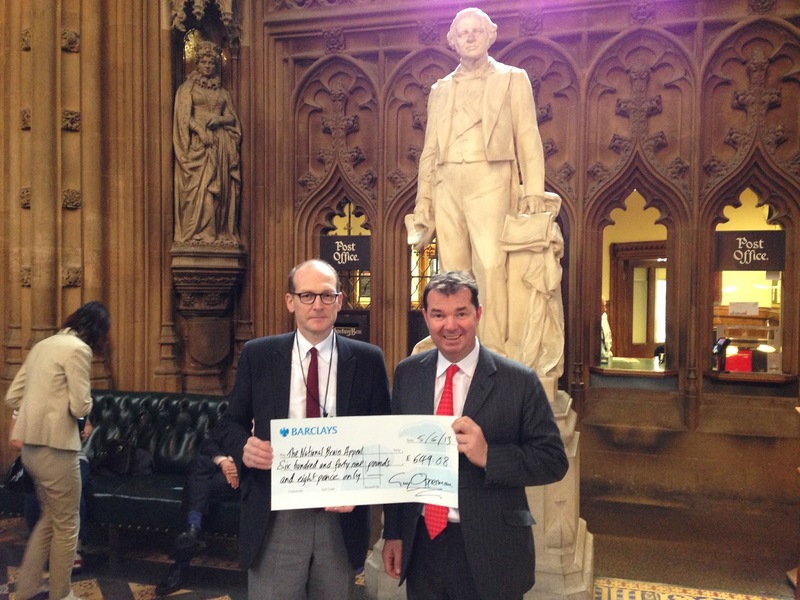 This allows schools to provide targeted support to disadvantaged pupils. The conservative element is that headteachers get to decide how best the £900 per pupil is spent. Apprenticeships: and again the government is directing funds to give young people the skills they need to succeed. Locally apprenticeship starts have increased by over 50 per cent in the last year. Real terms growth in the NHS and social care budgets show a commitment to the social contract with the British people. This is a social contract, not a socialist contract. Increased NHS spending is being combined with stripping out unnecessary tiers of management and bureaucracy, and enhancing patient choice. Pensions: Towards the end of the life cycle, the triple lock guarantee that the basic state pension increases each and every year by the highest of earnings, prices or 2.5 per cent. Compassionate Conservatism is not just about spending. The chancellor’s cradle to grave conservatism is matched by tough reforms to the welfare state, the introduction of Universal Credit, and getting 1.5 million people back into work. Wealth has been redistributed from the rich to the poor by raising the tax threshold to £10,000. The rich have been taxed more every year under this government than they ever were under Gordon Brown, confirmed by the Institute for Fiscal Studies. Yesterday the House of Commons debated the proposed reductions in the Ministry of Justice's budget. - I have no doubt that the government needs to cut the bill that the state is presently is required to spend on legal aid in this way. Although this government has cut budgets of various departments dramatically we still spend more than we earn and this is not sustainable. I have seen Defra and other budgets cut by up to 30% - other public sector workers are taking significant pain and lawyers have to do the same. That principle is, I am afraid, unanswerable. Every government, of whatever hue, would be doing such things. - there are enormous savings to be made through the system running more efficiently, with fewer delays and mishaps. We must be careful that a rise in the number of litigants in person will almost certainly have a knock-on impact on the justice system, and not in a helpful or money-saving way. - I am no fan of Price Competitive Tendering and am arguing against its inclusion in the long term plans. It will have an impact on the provision of legal services in largely rural communities. It is fair to counter that argument with it not being the job of government to provide state services indirectly but that is not an argument I feel comfortable with when one considers the difficulties in living in the country's most sparsely populated county. We are constantly fighting a battle here in Tynedale on the aspects to which the state is responsible for the provision of services to the consumer public that I see this discussion and its effects as a similar point. A balance has to be drawn. I could not speak in the debate but suspect that it will be raised again in parliament, both in public and private, in the next few weeks, and will update key constituents as best I can. Yesterday was the monthly transport questions in the House of Commons and I got the chance to press the Minister to try and help improve the woeful 685 run by Arriva. Norman Baker , who is on eof hte best of the Liberal Ministers replied. We are going to set up a meeting with the Minister and Arriva; several North East Labour MPs, including Phil Wilson, MP for Sedgefield, are also very concerned at Aarriva's performance and came up to me afterwards and expressed similar concerns. The quality of bus travel between Newcastle, Hexham and Carlisle has suffered terribly due to the mismanagement of Arriva. Specifically, many of my constituents encounter great problems with the service being perpetually late or even buses running out of fuel. Will the Minister reassure my constituents that the next time he meets Arriva, he will urge it to improve the quality of this service? Norman Baker (Parliamentary Under Secretary of State (Regional and Local Transport), Transport; Lewes, Liberal Democrat)I am always keen to improve the quality of bus services for passengers. The satisfaction level of bus travel as measured by the independent Passenger Focus is 84%, and in Tyne and Wear, for example, it is 87%. If the hon. Gentleman is concerned about particular issues in his local area, I would be happy to pursue them with him and the relevant bus company. I support the work being done to turn this country's economy around. We came into Government to address one of the biggest economic crises since the Second World War. While it is never straightforward, Britain is moving out of intensive care - from rescue to recovery. The Spending Round sets out how we will secure that recovery. We have applied three principles: reform; fairness; and growth. We will invest over £300bn – guaranteed to the end of this decade. Current spending will reduce by £11.5bn in 2015-16. The decisions we take aren’t easy, but we are making more progress towards a Britain on the rise. • Council tax bills kept down. The Government will support councils to freeze council tax in 2014-15 and 2015-16. This will mean nearly £100 off the average council tax bill for families over the next two years. • Health: NHS protected, social care prioritised. We are protecting the NHS. Efficiency savings are re-invested in the frontline. We will merge part of the health and social care budgets, spending £3 billion on joined-up care. • Welfare: capping spending and new conditionality package. A tough new welfare cap to control costs from April 2015. New conditions imposed on jobseekers: weekly jobcentre attendance, Upfront Job Search and a 7 day wait before claiming, claimants will lose benefits unless they learn English. The resource budget will be cut by 9.5%. • Transport: infrastructure prioritised. The transport capital budget will rise by 5.5% to £9.5 billion. The capital budget for transport will be set out to 2020, allowing the largest programme of road investment for 50 years. The resource budget will be cut by 9%. • BIS: science and apprenticeships boosted. The BIS capital budget will increase by 9%, which includes huge investment in science, with real terms increases in science capital to 2020. Apprenticeship funding and UKTI support for exports will be increased. The resource budget will reduce by 6%. The Second Reading of the HS2 Preparation Bill takes place today. I believe it is the right project for Britain. HS2 is a vital part of the infrastructure overhaul that this government is delivering so that our country can compete in the global race. It will be the first line to be built north of London in 120 years and the simple fact is that, without it, the key rail and road routes connecting London, the Midlands and the North will soon be overwhelmed. Rail travel has doubled in a decade and even on moderate forecasts, the West Coast Mainline will be full by the mid 2020s. Therefore, this is not a choice between upgrading the existing railway and building a new railway. It is a choice between a new high speed line and a new conventional railway. The significant additional benefits make high speed the right answer. As well as addressing the issue of capacity, HS2 offers huge opportunities to create jobs and boost our economy. Our lowest estimates are that the project will create 100,000 jobs. The Core Cities group goes further, predicting that it will underpin four times that number, with 70 per cent of them outside London. It is expected to provide around £50 billion pounds worth of economic benefits for the economy, with some estimates suggesting it will add more than £4 billion before it is even open. Our towns and cities, particularly across the North and Midlands, cannot afford to lose out on these opportunities. Today marks an important milestone in the journey to HS2, as parliament votes on it for the first time. There will no doubt be challenges on the way. The fact is that the easiest thing for the government to do would be not to build it. But that would also be the wrong thing to do. HS2 is a once in a generation project that can be an engine of growth for the whole country. I hope you will work with me to make sure we fully realise its benefits while effectively managing its impacts. This week I have written to bus company Arriva to complain at the appalling service provided by the 685 bus between Newcastle and Carlisle. People are missing hospital appointments, are late for work, and losing faith in the bus services given the repeated problems with the Arriva service. I am hoping that things will get better but I may have to raise the poor service in parliament. My thanks to everyone who has written in and let me know of the problems - we are working on it and Arriva assure me that they are trying to improve the service. One of the best things about Haltwhistle is HUFC, and it has been a pleasure getting to know the coaches, supporters, mums, dads, and all the football mad youngsters who get stuck in and participate in their local football club. At a time when there are many teams who are struggling for players and helpers this group goes from strength to strength - it is clear that everyone really enjoys the team spirit and the game itself. They show enthusiasm, commitment and enjoyment - and that's just the coaches! Pictured are just some of the teams and parents who turned up for Saturday's awards ceremony. I am a big fan of Haltwhistle United Football Club and urge everyone to get involved, do some sponsorship, or have a trial. Who says there is nothing to do in Halty? One final point - the pictured team are the all conquering Under 15s with just one of HUFC's inspirational coaches: this lot were undefeated last season - played 18, won 18, is quite an achievement, given Haltwhistle's size. A great bunch of lads. Also, at a time when we are trying to encourage girls in sport I was really impressed with the girls team who are getting better at football all the time. They chose their pink outfits and the rumour is that the boys now want pink as their away strip. It was a great day - full credit to all the organisers. The Spending Review announcements on Wednesday dominates the wedstminster week but there are debates and bills on HS2, Armed Forces, careers advice in schools, and overseas companies paying more tax in uk also feature this coming week in the House. I am here till Thursday lunchtime then home for multiple school visits on Friday, surgeries and variety of events this weekend. The greatest cakes ever were seen at Tarset on Saturday. I popped in to help present the prizes after sterling work by a dedicated team of cake tasters, led by Tony Gates and John Grundy, in an event organised by the local community in Tarset. I had the dubious distinction of having to judge a Champion of Champions. For me there could only be one winner - Mary Lou Downie's beautiful designed carrot cake, which had earlier won the Landscape Features Class. - With a few delicate wisps of grass either side of the sheep, who was exquisitely designed. All the cakes were brilliant but this was my supreme champion. A great event - wished I could have stayed for a jar or two afterwards but had to dash off. Molly, a 12 hand Dartmoor Pony, stole the show at Acomb Court care home last Friday and I love the fact that the local business of Katy and Laura is so successful, and helps the residents so much. Molly is the horse who happily takes the lift, is wonderful with residents, and who loves to be petted, and has only a slight weakness for sugar lumps. Molly is seen with her owner Laura and local resident Margaret Newton, who adored Molly and could not stop petting her. Also seen with us at the wonderful Acomb Court in Hexham are the Hexham Middle School choir - who are shortly to be heading on up to Hexham QEH. The choir were on good form, and it was good to see Elizabeth and Aneesha, 2 of the youngsters who had come to the House of Commons and were my maths gurus who helped to change the way we do long division in this country. I am a big fan of National Care Home Open Day. Everyone was very happy at Acomb Court. I had to go to do a surgery but Molly happily got in the lift and went off to meet the residents on the 1st and 2nd floors, chatting away to lots of residents. A very moving day, that I had to blog about. Greenbelt around Ponteland and Darras Hall and Tynedale will now have its own voice in Parliament. I have joined with other MP's to form an all party Parliamentary Group dedicated to the protection of the Greenbelt. I hope the group will allow the voices calling for the protection of the Greenbelt "to be heard louder, and at the very top of government." There is no doubt in my mind that defending our precious countryside from big developers, like Lugano, who are simply looking for a quick buck is the right thing to do. Greenbelt campaigners in my constituency have my full and unwavering support and I hope this new group will help ensure they have support in Westminster too. In early Autumn Northumberland County Council will move to the next stage of its Core Strategy consultation, producing reports on housing need and identifying sites for future development. I stand shoulder to shoulder with local campaigners as the battle to protect our local countryside intensifies. I will be scrutinising every move of the County Council and the developers as we draw closer to the final Core Strategy document. I will happily lead this fight from the front. Some good news for Hexham: BBC Children in Need North East and Cumbria has decided to broadcast this year’s Children in Need Appeal live from Hexham. If previous years shows are anything to go by there will be thousands of people coming into Hexham to watch the programme live with many thousands more watching at home. That should be great for the town. I think it will be great and I know Hexham will put on a good show, and raise loads of money for this excellent charity. I shall be at Tynedale Rugby Club watching - 4 years ago I was in South Africa - huge good luck to the team! Two of my Tynedale residents have been given Honours by the Queen. Alex Waters has made an MBE in recognition of his support for youth sport. I know Alex well and he does a huge amount of work for young people and sport, he is a former Chairman of Prudhoe Football Club and involved with the Hexham Mini League and Sports Council. An honour well deserved. Eileen Rogerson, has been subpostmistress at Kirkwhelpington Post Office for the last 25 years, and has been awarded the British Empire Medal for her services to her community. With the help of local traders, I have organised a community clean up day to help spruce up the Hexham town centre. The event will start at 9am on Saturday 6th July with a range of activities, from litter picking, to cleaning up local monuments and public buildings. The Clean Up will be starting at 9am meeting at the Market Place. Hexham is a fantastic place to live but we want to make it even better. That is why I hope people will join me and many others for an hour or so to roll up our sleeves and help give our town centre and our local shops a boost. I hope the rest of that week will be dedicated to making Hexham look its best with our Hexham Clean Up Week, when we are asking residents, retailers and community groups to take some time to improve a part of the town they care about, identify the problem areas and help us tackle them. Answer came there none... Bizarre debate in HOC yesterday when Labour MP's, including the Chairman of the Home Affairs Select Committee, Keith Vaz, MP, repeatedly asked the Labour Shadow Minister what was the Opposition policy on the Family migration rules, and the Migration Advisory Committee Cap of £18,600. The shadow Minister had no answer. The reality is that the Labour front bench agree that the Coalition have the right policy but cannot bear to admit it. So on it goes - everything is opposed but nothing would be done differently. There is a consistent pattern here. Labour is a policy free zone. Yesterday was an open admittance of that. 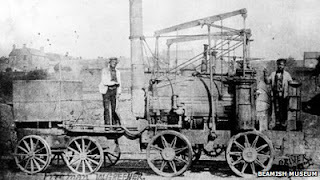 40yrs of The Wylam Globe and Puffing Billy festival coming soon! I am a big fan of local newsletters. As well as my own, which I produce as your local MP to keep people up to date with my activities, I am a keen reader of those produced by our local Parish Councils. One of the most recognised is "The Wylam Globe" - the newsletter from Wylam Parish Council. Believe it or not the Globe has been going for some 40 years! It was first produced in July 1973 and has been in production every since. That's longer than The Independent newspaper! Tom Martin, Anne Francis, Maureen Gillis, Brian Japes, Tony Mitcham, Stephen Barlow. Tom Martin was re-elected as Chairman of the Parish Council. I grew up between the ages of 10-14 in Dublin, Ireland and have worked in Northern Ireland. It was not easy 25 years ago as a young Brit with short hair working and riding out at a racing stables in the North. There were deaths reported on the local TV every night, and the stables I worked in was a couple of miles from Armagh and Lough Gall, which were hotbeds of the troubles. I therefore find it a wondrous and special thing that we have a G8 conference taking place relatively peacefully in the Northern Ireland, showcasing the wondrous scenery, and hospitality of this great land. When people say peace is not possible in some parts of the Middle East and elsewhere I always tell them of the land that was and now is Northern Ireland. It recommends a new criminal offence for “senior persons” who run banks in a “reckless manner”, as well as much more stringent clawback rules that could see managers being stripped of several years’ worth of pay. “Where the standards of individuals, especially those in senior roles, have fallen short, clear lines of accountability and enforceable sanctions are needed,” Mr Tyrie said. • A government inquiry into the break-up of Royal Bank of Scotland. It said RBS was holding back Britain's economic recovery and ministers should consider breaking it up into a good and bad bank. The report is the fifth and final publication by the commission, whose members included Justin Welby, the Archbishop of Canterbury; Lord Lawson, a former Chancellor of the Exchequer; and Lord Turnbull, a former head of the Civil Service. The commission was set up last year in the wake of the Libor-rigging scandal. Recommendations requiring legislation are expected to be added to the Banking Bill that is currently going through Parliament, meaning a criminal law for bankers could be in place before the end of 2015. Under the new system, senior managers would have to sign up to a new code of conduct and, according to the commission, would be “fully and unambiguously aware of those responsibilities”. The British Bankers’ Association said the document was the “most significant report into banking for a generation” and would help UK lenders become the “gold standard for professionalism and integrity”. Reformist-backed cleric Hassan Rouhani won last week's Iranian presidential election, securing just over 50% of the vote and so avoiding the need for a run-off. Rouhani said he had achieved a "victory of moderation over extremism". Some 72.2% of the 50 million eligible Iranian voters cast ballots to choose the successor to Mahmoud Ahmadinejad. Mr Rouhani, who has pledged greater engagement with Western powers, said: "This victory is a victory for wisdom, moderation and maturity... over extremism." The USA stated it would "engage Iran directly" to find a "diplomatic solution that will fully address the international community's concerns about Iran's nuclear programme". One of Mr Rouhani's main pledges was to try to ease international sanctions imposed on Iran over its nuclear programme. Iran has been suffering economic hardship, with rising unemployment, a devalued currency and soaring inflation. For my part I welcome his election - he is clearly the most moderate, reform minded and open of the Iranian leaders. And the fact is that he was fairly elected by a more modern Iran, whose voters seem to want change. The second crumb of comfort comes today in a wonderful interview with the veteran Israeli Leader, Shimon Peres, who has given a very conciliatory interview on Iran - Israel relations. Asked if Iran and Israel could ever have direct negotiations with each other, he replied: "Why not? The Iranians are not our enemies. We have nothing against Iran." 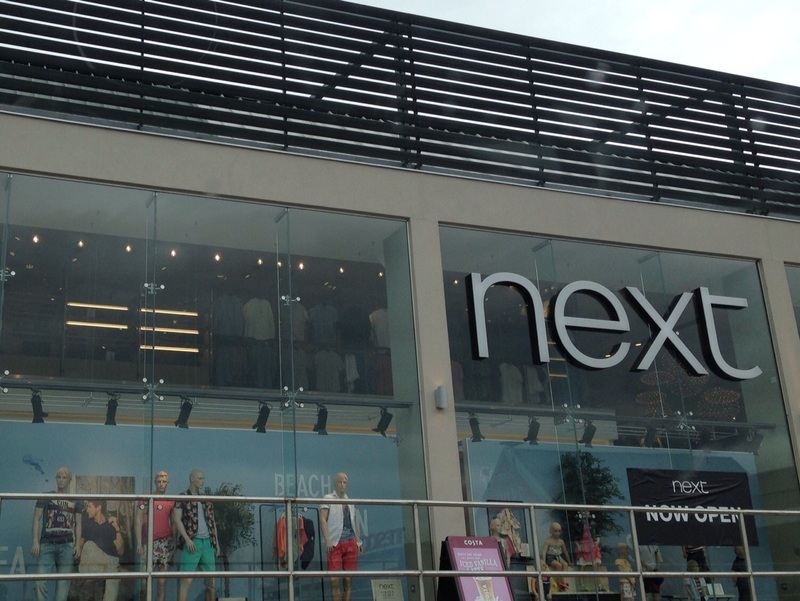 I am pleased to report that Next's new store in Hexham is proving very popular. It is great to see a new business set up shop in the Town. I visited the store when it was under construction as part of our "In Hexham, For Campaign" to get more businesses to come to our wonderful town. 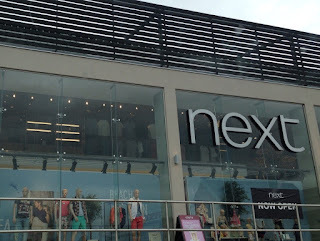 The store is located next to the Tesco in a revamped building which had been empty for several years. I hope it will bring more visitors to the town who will go on to use the shops in the Town Centre - and reduce the pull to the Metrocentre. There are also a significant number of jobs locally. 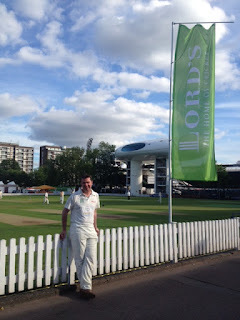 Yesterday I got to play against the MCC at Lords, on the nursery ground. It was the fulfillment of a boyhood dream. The pitch was firm and hard, our opposition the feared and mighty MCC. The match ended in a draw with our team 4 short in a run chase with one wicket left. Every possible result was possible on the last ball of the game as the sun went down over London. The day started well when I took the first wicket by stumping an MCC batsman who dared to give the charge to the Reading MP, Rob Wilson's off break. But the MCC are made of stern stuff, and proper cricketing ability, and they scored at will, stroking the bowling of the part time parliamentarians to most parts of the ground and beyond. Sadly my batting, which is normally that of a robust number 6, proved hopelessly outclassed by a pacy former county player who did me all ends up first ball. The umpire helpfully took a picture of the carnage that were my stumps after my forward defence so obviously failed to blunt the 75mph MCC bullet. Thanks Mr Umpire! We were captained by my Yorkshire colleague Nigel Adams MP, and our team of MP's featured such esteemed finance gurus [and cricketers] as Joe Johnson and John Redwood, our Labour colleague and demon opening bowler Sadiq Khan, the shadow Justice Minister, and the outstanding athletic fielding prowess of the diving Milton Keynes MP, Mark "Bomber" Lancaster. Mark produced the champagne moment with a boundary diving stop and gather that Jonty Rhodes would have been proud of. But the highlight of the match was a brilliant hundred by Nigel Adams, scored at more than a run a ball, which almost saw us home. I have played with the skip a few times down the years and yesterday he batted with a freedom few have seen him have before - seeing off the new ball with only a few played and missed, before then tucking into the off spinners like a Celtic supporter in a pie shop. 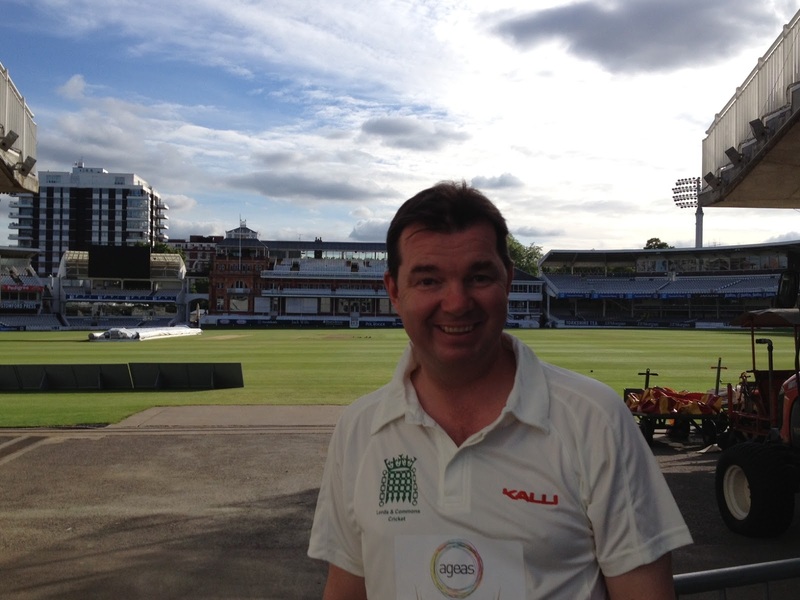 Nigel never likes running singles so he decided to get a hundred the IPL way - hitting 18 fours and 4 sixes in his ton. It is a brave bowler who puts the ball in Nigel's hitting zone and sure enough many a ball disappeared robustly in the direction of cow corner. 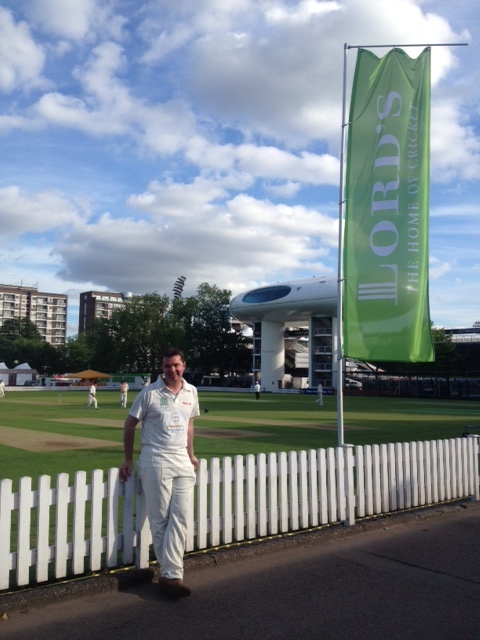 Huge thanks to all the Lords staff for making it possible and the MCC team, who were a great bunch of lads. "Every time I play at Lords I feel like a kid on Christmas Day... the whole place is magical"
I am pleased to say I now know how he feels - it was an incredible experience. Tomorrow I have a meeting with the company who seek to develop the old Tranwell Airfield site, something which is strongly objected to by the local community. I have asked the developers to come and meet with me in the Commons. I am grateful to the lead objectors, Karen and Penny, for giving me the questions they would like to see answered. Amongst other things I will also be raising with them the new planning guidance, the impact on the local community, the visual blight and the problems such windfarms cause the radar of the RAF / airports. I could not be in the House for Thursday debate on the Iraq war but would strongly recommend my colleague Rory Stewart's speech; the MP for Penrith and the Borders is both my political neighbour and a friend of mine. But there are differences: I hike, he goes on odysseys. I write short books, he writes weighty tomes. And I did not spend a lot of time in Iraq / Afghanistan. The starting point for any discussion of Iraq has to be an acknowledgment that it was a failure and a scandal. However we look at the costs and benefits of what happened there, it was probably the worst British foreign policy decision since the Boer war or the first Anglo-Afghan war of 1839. Everybody in the foreign policy machine then predicted that it would be different at the end of 2005, and we were all wrong again. Why were we wrong? We were wrong because we did not have the right relationship between politicians, diplomats, soldiers and the local reality of these countries. We have not got it right yet. We have not got it right because it is not realistic today—as it was not realistic at the time of the Boer war or the first Anglo-Afghan war—to expect people in Parliament to be experts on the internal politics of Iraq. What really began to go wrong after the invasion, beyond the decision about WMD, was all to do with micro-relationships in Nasiriyah and al-Amara and in the relationships between the different grand ayatollahs in Najaf. These are not things that anyone in the Chamber, however well briefed, can pretend to understand or judge. Instead, we have to rely on the military, the Foreign Office and the intelligence agencies, and there the problem starts. The problem starts because the entire structure of our organisations—their incentives, their promotions, their recruitment, how they interact with policy makers, politicians and Ministers—does not help us ever to acknowledge failure. In fact, these institutions are designed to trap us in these countries. Careers are made by people going out for short tours. I remind the House and those in the Foreign Office that the initial tours in Iraq were for six weeks, extended to three months, then to six months. The idea—that people living in heavily defended compounds, moving around in armoured vehicles, generally unable to speak a word of any local language, unable to interact with an Iraqi for more than half an hour or an hour at a time, except if surrounded by heavily armed men and operating through translators, could really get a sense of whether Iraq was stabilising or what, to use the Minister's words, Iraq would be like in 10 years—was of course misleading. The advice and challenge that they could provide to the Government, therefore, was not good enough. It is not good enough that not a single senior British diplomat formally recorded on paper their opposition to what was happening in Iraq. Many of those who were inside the system now say that they made private comments, that they were worried, but nobody, from the political director downwards, formally objected on paper to the PM. When I look back at the reports I wrote stuck in al-Amara and Nasiriyah, I find it extraordinary how every week, I claimed great success. Every week, I would write, “We’ve hired another 300 people into the police. We’ve held a new sub-district election. I’ve just created 3,000 jobs. We’ve just refurbished another set of clinics and schools.” To read report after report, week after week, it looks as if the whole thing is getting better and better. In retrospect, I know differently, of course. When I began, I could go into the bazaar to get an ice cream, but by the end, I was stuck in my compound with 140 rocket and mortar-propelled grenades flying at the compound, and we had to abandon it and retreat back to a military base, essentially surrendering Nasiriyah, a city of 600,000 people, to the insurgents. writing enough about Iraq. The Foreign Office is not thinking enough about the failure. The military is not thinking enough about these things. Unless we acknowledge that something went wrong in Iraq and that something went deeply wrong in Afghanistan, we will get ourselves stuck again. We believe that somehow it is all the fault of Blair and Bush—this is the myth that has entered the national consciousness. My experience as someone inside the system is that we have to look much more deeply at ourselves. We need to look at the Foreign Office, the military, the intelligence services and Parliament. These people, Blair and Bush, do not operate in a vacuum; they operate in a culture that did not challenge and shape the debate sufficiently. It is not realistic for Blair or Bush to know deeply about these situations and it is simply a constitutional convention, of course, that the people who make the decision are the Blairs and the Bushes. However, if we look at what got us trapped on the ground in Iraq—at why, for example, Gordon Brown found it difficult to get out of Iraq or why Obama found it difficult to say no to the surge—it is because these people are part of a much bigger system. The reform of that system is threefold. First, we need radically to reform the way in which the Foreign Office operates. William Hague has begun; we need to go much further, thinking all the time about the lessons of Iraq and Afghanistan. We need to focus on people with deep linguistic and cultural expertise. We need to ensure that we change all the bureaucratic mechanisms. The core competency framework for promotion in the Foreign Office needs to be changed. The amount that people are paid for learning languages in the Foreign Office needs to be changed. The posting lengths need to be changed. The security conditions for the Foreign Office need to be changed, because unless we begin to understand deeply and rigorously what is happening on the ground, it is difficult to challenge the Blairs and the Bushes. I am not here to defend that decision—it was a terrible, catastrophic decision—but I think it is dangerous to put the whole blame simply on Blair and Bush, because the implication is that if we do not have Blair and Bush around, we will never get in these messes again. We will get in these messes again because we have not created the proper Government policy structures required to think these things through—not just to avoid the decision to invade, but above all to get out more rapidly once we have made a bad decision. Military reforms involve accepting that the military have too much power in the policy debate. That is not the military’s fault: they are filling a vacuum. I remember a major-general saying to me, “The diplomats and aid workers aren’t doing anything, so we”—the military—“need to take those things over,” but that is not the military’s job. It is extremely dangerous, because its puts generals in positions where they make optimistic predictions about their capacity to sort things out, albeit without a detailed understanding of the politics or the reality of those aspects of governance or diplomacy. We therefore need to create a system that we can rely on in the Foreign Office, the military and the intelligence services. We in Parliament need to know how to question those people, how to listen to them and how to promote people who disagree with us. We need in Parliament to learn how to look at which civil servants got it wrong and hold them accountable, rather than promoting, as we did, almost everybody who was implicated in the Iraq decisions. Finally, we need above all to learn—I feel, as a new MP, and with all deference to this House—a lesson of humility." Next week we have a very special guest heading North. My overall boss at the Home Office,Theresa May, is coming to a joint dinner for members of Hexham Conservatives, and our Cumbrian counterparts. I have worked in Theresa's department - the Home Office, specifically for Immigration Minister Mark Harper, since last September. There is no question that Theresa has proven to be one of the Coalition's most capable Cabinet Ministers. It is well worth a read on many issues like police and civil service reform, and interesting stuff on prison and deportation policy. This week I took part in the Children and Families Bill debate. In my former life as a lawyer I represented dozens of families and local authorities who were grappling with the disjointed and poorly organised system that existed when parents were trying to get a statement of special education needs [SEN] for their child. This would relate to a variety of conditions ranging from Autism, ADHD, and Aspergers. Such a SEN application generally used to be expensive for the state, feature a host of different organisations working in silos, and create upset and strife for parents and local authorities alike. 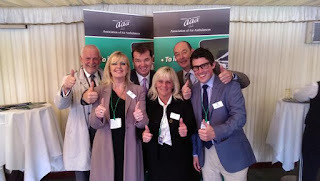 The changes have cross party support and are very welcome. I raised two questions of the Minsiter, Edward Timpson - an MP who really knows his subject. Guy Opperman (Hexham, Conservative)Will the Minister reassure some local authorities that the proposal will still ensure integration between the 1970 legislation, the Children Act 1989 and this Act, and make sure that there is not a silo system that does not have the integrated service that we all so want? social care have tended to work in parallel rather than in conjunction with one another. In many of the clauses, both through the general duty to co-operate, the joint commissioning clause, and now the duty on health as well as the duty to consult parents and children themselves, there is already, with the pathfinders, a growing involvement of each of those different agencies in coming together and concentrating on the central and most important issue, which is the child. I hope he will see that the Bill gives local authorities an opportunity to nurture and grow their relationships with health and other agencies, and ensure that as a consequence they are providing better services for children in their local area. sustainable reform, is not the whole solution. We also need to see—this is happening through the pathfinders and starting to spread outside them as we develop the changes in the system more widely—a recognition that those bodies must play their part at grass-roots level and recalibrate the sorts of relationships that in the past have not been good enough to help deliver the required provision. My further comments are set out below. I am not sure whether I need to, but I will make a declaration: I have represented about 100 applicants for statements at special educational needs and disability tribunals, and local authorities still owe me money for some of them from before 2010. The simple question that my constituents in Northumberland would like answered, if that is possible, is this: will these proposals make it easier to gain a statement for those parents who have been trying to do so for so long, given that the process has been so convoluted and difficult over the years, as we have all found? family feeling that they are working in a different environment from those around them. By ensuring that that happens, we will reduce the prospect of conflict, misunderstanding and, therefore, the road to tribunal, which we all want to avoid. That is why we included the mediation process, albeit on a voluntary basis, to give parents and those responsible for providing services every opportunity to work together, co-operate and consult at every stage, but particularly in the early stages, in order to avoid unnecessary discord and damage further down the line. I am supporting local campaigners calling for a 20mph zone to be put in place on the main road through Wylam village. A petition supporting the move has already gathered over 600 names in the village. There is clearly a very strong case to reduce the speed limit down to 20mph on this stretch of road through the village. Wylam is an fantastic village, but as a keen cyclist myself I know how quickly some cars can travel thought the village. The solution to prevent further accidents is very simple: the speed limit should be reduced from the often flouted 30mph limit down to 20mph for this part of the road. The County Council have the power to make that change and it would cost very little to implement. There is no need for any grand scheme simply to put in place a speed limit which is the approach for the area, which in this case many villagers have made clear is 20mph. This change would not be costly but would make the village a much safer place for children and elderly residents as well as cyclists and pedestrians in general. Jade Scott works for me. As the first MP to hire, train and then retain with a job an apprentice, in the form of Jade, I know what she has learnt and how hard it is to be an apprentice and then have the job helping to run the Hexham office. The TV show is not like that. So to a certain degree I agree with Vince Cable, the business secretary, who said yesterday that the show was sending out the wrong message. For my part, I still believe that there remains a need to utilise the power of the rivers / tides in this country to create an energy source that is not affected by fossil fuels. I also believe that there are good examples where a hydro project, a fish pass, and a need to maintain both the fish in the river and their smooth passage upstream do exist. On this occasion we have not been able to make it work due to lack of money, but the evidence put before me last year makes it clear that this can be done. It is important to note that at all stages the Hydro team were adamant that they did not want to disturb the fishing, and all the pleasure and tourist revenue that the Tyne generates. I was pleased to host over 150 patients, Air Ambulance Trust staff and trustees, clinicians, and dozens of MPs and Peers who came along to yesterdays Association of Air Ambulances Reception. The 2 hour event was a huge success and I am seen pictured with the wonderful team from the Great North Air Ambulance [who are, of course, the best Air Ambulance in the country], who had a great time and chatted at length with my Stockton South colleague James Wharton and Wansbeck's Ian Lavery. Many congratulations to Clive Dickin and his team, and my staff who worked long and hard to make sure this event went off without a hitch. 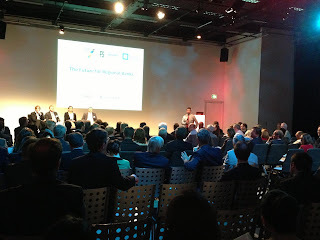 One Chief Exec said to me, "I have never been to an event like it" before adding "and the speeches of yourself and Lord Howe made the point, but mercifully did not go on too long." There is a compliment in there. Lord Howe spoke very supportively of the work all Air Ambulances were doing and, in particular, on behalf of the Department of Health about the work being done on helipads for use by the helicopters. Most of all two memories remain: it was a chance to celebrate the great work of these small, dedicated but enthusiastic teams of local people do up and down the country. And secondly it was wonderful to see so many former patients, like the young female Londoner or the motorcyclist from Bishops Stortford I met, both of whose lives were saved by an Air Ambulance team. After all, everything we do is about saving patients lives and to hear them speak and eulogise about the service was very moving. Visit, understand and admire your national park! Then accept that Northumberland National Park is the best! Environment Minister Richard Benyon, MP, was in Northumberland yesterday visiting the Northumberland National Park and helping to launch a nationwide campaign which aims to increase understanding of the work of the national parks and the benefits they offer for rural living and working, conservation, leisure and environmental services for the whole population. Sadly I could not be with him as I was in Westminster yesterday but I will be in the park in the wonderful community of Tarset, west of Bellingham, on Saturday night June 22 when I am helping to judge a food competition, and going to the brilliant pub in Greenhaugh. Why Politics must appeal to the Facebook generation - thoughts on how we can do it better? I am really grateful to Fiona Forsythe, of Prudhoe, for alerting me to the blog of Marian Sainsbury that I have reproduced in its entirety below. I am trying to do what I can with a daily blog, twitter and facebook, plus huge numbers of leaflets on local and other issues trying to set out what I, as the local MP, am doing on behalf of my constituents. The blog is the biggest in the north east and you can see what I have done as the candidate and the MP for pretty much every day of the last 4 and a half years. I accept it is my job to try and engage the younger generation and try to do this with school visits, question times, public meetings, the charity walks and so much more. But all better ideas accepted. I agree that political engagement – or the lack of it – is once again in the news, with Thursday’s Panorama programme adding to the general cynicism and last Sunday’s Observer opining that ‘democracy, far from flourishing, is sicklier than ever’. Lack of engagement among young people is one strand in this general malaise, and on this issue we at NFER have evidence from a fascinating series of surveys that tracked a cohort of young people from when they started their citizenship education at the age of 12 in 2002, to 2011, when they had had the chance to vote in the 2010 election. It is from this 2011 survey, which included 1500 young people, that we gained a wealth of insights into the views of young voters. The initial signs were not encouraging: only 59 per cent of our sample actually voted, and 79 per cent of respondents had little or no trust in politicians. We were interested to find out whether there were patterns of responses that could identify distinct groups of young people in respect of their political views and involvement. When we applied statistical techniques to this question, five such ‘profiles’ emerged, ranging from highly engaged to uninterested. More about these profiles can be found in the full paper but for the current debate, it is the difference between traditional and online involvement in politics that offers some interesting possibilities. Of our five profiles, only the highly engaged group – about one-fifth of the sample – are at all likely to take part in traditional means of political involvement such as meetings, demonstrations or writing to an MP. There are three groups in the middle with different levels of partial engagement, who are generally not interested in getting involved in traditional ways – but who are much more active online. When asked how often they ‘Find out about social and political issues from Facebook or Twitter’, over 40 per cent of these partially engaged groups said they do this at least once a week. Over 40 per cent of these groups also say they have signed online petitions. 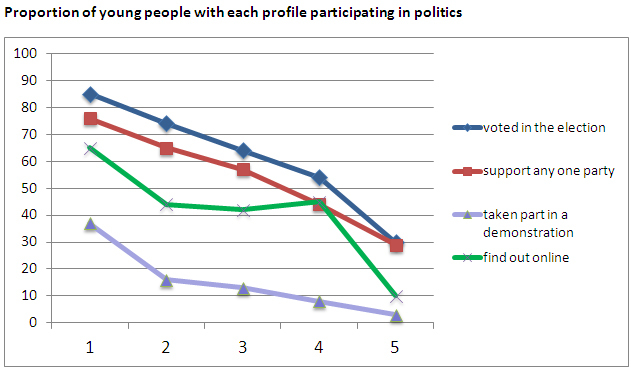 The graph illustrates how online involvement contrasts with traditional modes. The ‘highly engaged’ group is labelled 1 and these young people have active involvement of all kinds. Groups 2, 3 and 4 have declining levels of traditional involvement, but their online participation holds up much better. This means that about four-fifths of young people may be open to exploring social and political issues online, in contrast to the one-fifth who may be motivated to attend meetings or demonstrations. The Backbench Business Committee have given the House a day this Thursday from 11.30 to have a general debate on the Iraq war, on the 10th anniversary. I think it very unlikely I would be called to speak as it is oversubscribed but it will be a good opportunity to remember those who gave their lives, to reflect on what was done right and what errors were made, as well as making an assessment of the wisdom of getting involved and toppling Saddam. The added significance is that we have the brewing catastrophe in Syria and what this country wishes to do about it. I suspect that the lessons learnt from previous conflicts will feature heavily in both Thursdays debate and the future debate on Syria. 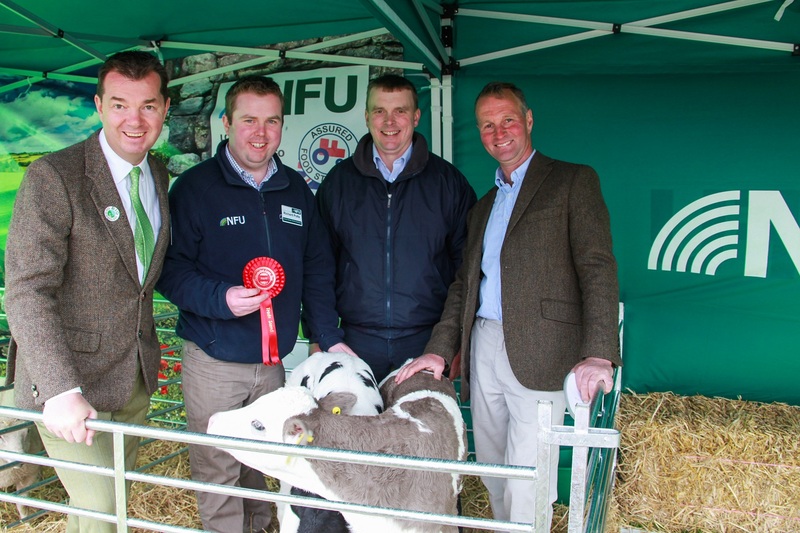 Two weeks on and it is right to celebrate the many successes of the County Show, and to thank all those who put in so much effort to make it happen - not least the show team, the hosts the Allendales, and all the stewards, judges, volunteers and standholders. I had a great day. 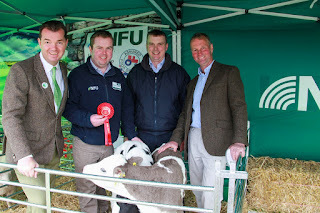 I am seen pictured with the outdoor stand winners, the NFU, who produced a fantastic interactive and live animal stand that had purists and kids all fascinated. They were deserved winners. Its an all action Saturday June 15 with the Roman Wall Show, at Twice Brewed and traditional village fairs at Catton, The Bellingham Rural Crafts and Gift Fair and the Goose Fair in Ovingham amongst a host of other things. Wednesday morning I am meeting Lord Heseltine to discuss the rebalancing of the British economy in favour of the North East, and other regions. Heseltine has set out a comprehensive economic plan to improve the UK’s ability to create wealth. His independent report makes the case for a major rebalancing of responsibilities for economic development between central and local government, and between government and the private sector. At the heart of the proposals are measures to unleash the potential of local economies and leaders and enable every part of the UK economy to raise its game. In addition Lord Heseltine has produced ‘No stone unturned: chamber of commerce - international comparisons’. Lord Heseltine presented his report to the Chancellor of the Exchequer and the Business Secretary Vince Cable. This forms much of the basis of the issues raised in the North East newspapers, NEvolution campaign, which I wholeheartedly agree and support. The most interesting Bill to be debated in the House this week is the Coalition's attempt to reform many aspects of the legislation relating to adoption, family justice, SEN, and so much more. The Government wants to see more children being adopted by loving families with less delay. Children wait an average of almost two years between entering care and moving in with an adoptive family. The Bill supports the reforms set out in An Action Plan for Adoption: Tackling Delay including by promoting fostering for adoption and improving support for adoptive families. The Government is committed to improving life chances for all looked after children. Their educational attainment, while improving, is not doing so fast enough. We know that a virtual school head (VSH) can have a positive impact on the educational progress of looked after children and so the Bill will require every local authority to have a virtual school head to champion the education of children in the authority’s care, as if they all attended the same school. The Government is reforming the family justice system so that it can deliver better for children and families who go to court after family separation or where children may be taken into care. The reform programme is tackling delays and ensuring that children’s best interests are at the heart of decision making. The Bill will implement commitments the Government made in response to the Family Justice Review including by introducing a time limit of 26 weeks when courts are considering whether a child should be taken into care and making sure more families have the opportunity to try mediation before applying to court. The Government wants to make sure that the Children’s Commissioner can act as a strong advocate for children, helping to embed a culture where children’s interests are put first. The Bill will help improve the Children’s Commissioner’s effectiveness, taking forward recommendations in John Dunford’s Review of the Office of the Children’s Commissioner (England) including giving the Commissioner a statutory remit to promote and protect children’s rights. The Government is committed to encouraging the full involvement of both parents from the earliest stages of pregnancy, including by promoting a system of shared parental leave, and to extending the right to request flexible working to all employees. The Bill will implement the commitments in the Government’s response (November 2012) to the modern workplaces consultation. I am the Chairman of the All Party Group for Air Ambulances in the Houses of Parliament: we exist to support and help the understanding of what our Air Ambulances do. We formed the All Party Group in the Commons when we realised that there was no support organisation helping the Association of Air Ambulances and making the case for these wonderful charities in the Houses of Parliament. It is cross party, apolitical and very well supported. for whom we do lots of fundraising, from charity walks to helping out on specific fundraising events. If you are thinking of a charity locally in the North East then they are a really great one to support. On Tuesday we will have Ministers present, including one from health and the heavyweight presence of the Secretary of State for Communities and Local Government, Eric Pickles MP. It will be a wonderful event and I am looking forward to hosting it. In Germany there is the holy trinity in the centre of every town: - Church, Town Hall and Local Bank, all of which are respected and which are the mainstay of that town. The Local Bank makes a profit but above a certain level it provides a contribution to the community it lives and works in. No local banker in Germany takes a bonus. If his bank were to go bust the German manager would never work in banking ever again. We lack a UN mandate, a clear diplomatic unified approach, an understanding of who we would be supporting, what support would involve, and what our objective is. I accept entirely that the civil war is a conflict on our Mediterranean doorstep that sees huge loss of life and a tragic waste of a wonderful country but I remain to be convinced of the wisdom of involvement. Most history shows that our involvement tends to make situations worse not better. The examples where we have had successful interventions in influencing internal conflicts in places like Sierra Leone, Kosovo or Libya are the exceptions not the rule. Banking is Britain is broken. The bankers in the City of London have for too long been more interested in making a quick buck rather than helping businesses grow, and families to buy their own home. Since my election as an MP in 2010 I have been campaigning for a new banking system. A banking system which is focused on serving local communities. A system of local banks, based in individual communities; a Bank of Hexham for example, or a Bank of Sunderland. A bank which is about people, not just profit. At our banking conference yesterday our campaign took another step forward when Teeside born Treasury Minister Greg Clark backed the idea. 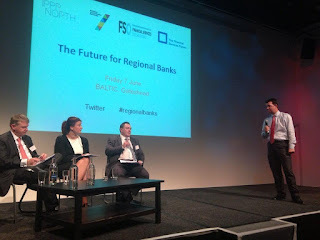 Greg, who is financial secretary to the Treasury, told delegates at the Baltic in Gateshead, that the coalition was eager to help new banks set up to help grow our regional economy. He said: “It is no coincidence that problems in the banking system have come hand in hand with more centralisation. “It was almost forgotten for some time by some people that banks exist to make the lives of their customers easier. yet community facilities have been replaced all too often by a system in which the computer says no. “And yet there is no substitute for being a part of your community. Gregg also drew on his Teesside roots to set out the historic damage caused by bank centralisation. “I grow up in Middlesbrough in the 1970s and 80s and you can clearly see in that era power slipping away from the region and elsewhere. “That was industrial power, financial power and political power and was by no means a phenomenon unique to the North East. “There was a time when Middlesbrough was described by Gladstone as an infant Hercules, and the industrialists who made it that way were indivisible from the community leadership. "The Treasury will today set out its support for regional banking as the industry gathers on Tyneside. Experts from the world of finance and banking will be at Baltic in Gateshead to hear how regional banks could prevent banking continuing to be concentrated in the hands of a small number of players. Hexham MP Guy Opperman has helped bring in key figures from the UK and Europe to go over how the North East can benefit from the changes. Among those he has brought to the event is former Gosforth Grammar School pupil Anthony Thomson, named as one of the City’s most influential operators after helping set up Metro Bank, a new customer friendly bank opening branches across London." Today in the House of Commons it is to be announced that, in future, residents will have to be consulted properly over new wind farms with applications barred if there is significant opposition. Councils are currently struggling to prevent wind farms down to a combination of the lack of the Local Development Plan and planning guidance that is generally very pro wind farms even where there is considerable local objection. The flip side, which is a good thing, is that under the plans, energy firms will be able to offer genuine local “incentives” – such as discounts on electricity bills – to persuade communities to agree to new wind farms. In addition, when planning applications are submitted, officials will have to take into account topography and the impact on “views” and historic sites. Inspectors will also have to assess the “cumulative impact of wind turbines” amid fears that some areas are being overwhelmed by applications.